It’s relatively easy to lead an active, outdoor lifestyle when the weather is cooperating. However, many of us struggle to stay motivated once it gets cold outside. Here are five ways to “embrace the chill” and stay active and healthy during the winter months. To winter-weather lovers, it’s no secret that the cold months are a great time for long outdoor walks – much more so than the muggy depths of August. The bracing winter air provides additional motivation to keep up the brisk 4-mile-per-hour pace that power-walking demands. This form of exercise is great for burning calories and providing cardiovascular benefits. In Philadelphia, take in the sights of winter along the scenic Schuylkill River Trail, which runs parallel to Kelly Drive. In South Jersey, be sure to visit Cooper River Park and power-walk the 3.8-mile loop around the river. Who needs the Alps? Cross-country, or Nordic, skiing can be done anywhere there are flat open spaces and a fresh snowfall. At its most strenuous, cross-country skiing is famous for being a true full-body workout and has been called the ultimate cardio exercise. It’s an amazing calorie burner and works your core like few sports do. Perhaps best of all, it’s low-impact and kind to your joints. Plus, you don’t have to take up backcountry mountaineering to cross-country ski – many county and state parks have groomed Nordic skiing trails and/or large open fields that are ideal for those new to the sport. There are few outdoor experiences as sublime as gliding through silent, snowy woods on a crisp and bright winter day. Beat the winter blues and fight winter weight gain! Like cross-country skiing, ice skating is joint-friendly and low-impact and has the additional benefits of improving balance and coordination – as well as helping strengthen the all-important “stabilizer muscles” in your hips, knees and ankles. Outdoor skating, especially, is a good workout, since you’re dealing with wind and other conditions. Seasoned skaters are well aware of the calorie-burning and flexibility benefits that the sport offers, but for beginners, ice skating is a wonderfully social activity to enjoy with family and friends! 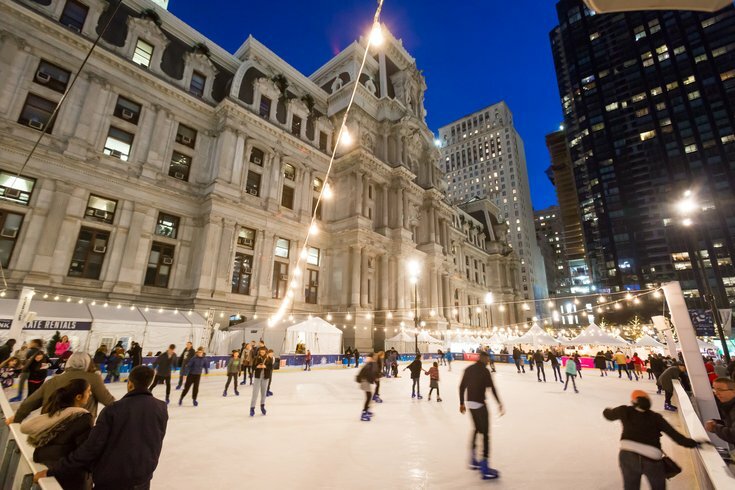 And with the Blue Cross RiverRink Winterfest conveniently located right on the Delaware River Waterfront, you won’t have to travel far to do it! Don’t laugh! Snowshoes have come a long way from the old bamboo-and-mesh “giant tennis rackets” from the old movies. New snowshoes are sleek, lightweight, high-tech and relatively inexpensive to buy or rent – especially basic models designed for use on simple terrain. (Mountaineering or backcountry snowshoes are more specialized and pricey.) Snowshoeing is very easy to learn and suitable for young and old alike. All you need to get started is snow cover and a desire to get out and walk. For weight control, snowshoeing is efficient – you burn far more calories snowshoeing than you do walking or running at the same speed. If you’re looking to become one with nature, Valley Forge National Historical Park is less than an hour’s drive from Center City and offers 19.5 miles of hiking trails suitable for any level of snowshoeing. OK, if you have an absolute aversion to the cold and prefer to stay inside, so be it – but that’s not an excuse for not maintaining your fitness level. Join the thousands who use their local mall for indoor walks (note: The nation’s second-largest shopping mall is only a 30-minute drive away in King of Prussia). Or, try a fitness class, join a heated community pool and do laps while the snow falls outside, or invest in some fitness equipment for that gym you keep promising to establish in your warm, dry basement. Whatever you decide to do this winter, do it because you enjoy it; that way you’ll stick with it. And remember, the bottom line is don’t stop moving just because the thermometer has dropped!